The patient, age 50, is a farmer who presents with flu-like symptoms—fever, chills, productive cough, myalgia, and pleuritic chest pain that developed over a few weeks. 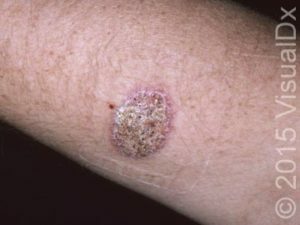 What worried him most, however, was a crusted lesion on his arm that was a large verrucous scaly plaque. View the photo and consider what your diagnosis and next steps would be. Resolution of the case is described on the next page. ← Longitudinal Assessment: A Dent in the ABMS Armor?